On Monday night, February 4, 2013 my little novella, Greater Than Rubies, became available as a free ebook on Amazon. It is now February 7 and at the time of this writing, there are 58,248 free Kindle ebooks on Amazon in just about every genre you could possibly imagine. 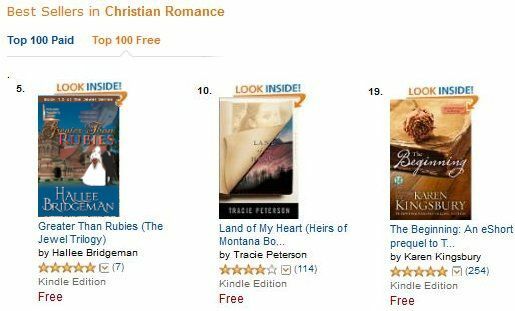 Greater Than Rubies is in the top 10 among free Christian Romance ebooks. In about 72 hours, my little novella Greater Than Rubies moved into the top ten in the Christian Romance category almost overnight and stayed there. As you can see, I’m presently more popular than some of my own favorite authors in my genre. But the bigger surprise is this. 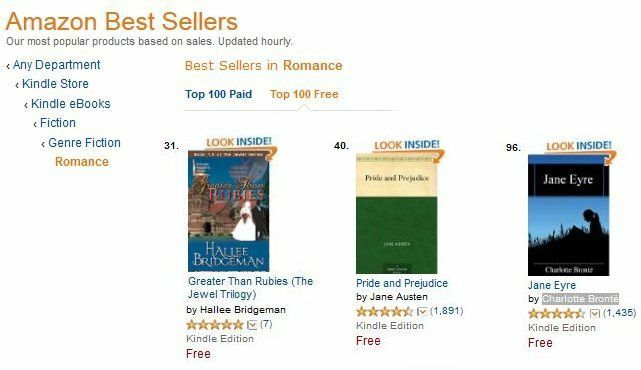 In just three days, Greater Than Rubies moved into the top 100 — then the top 50 — and keeps moving up in just the ROMANCE category — that is ALL free romance ebooks on Amazon. Right this second, it is number 31 so, on Amazon at least, I am more popular than Jane Austin and Charlotte Brontë combined. Greater Than Rubies is in the top 100 among ALL free ebooks. The MOST amazing thing is that among ALL 58,248 currently offered free Kindle ebooks — Greater Than Rubies moved into the top 100.At position number 84, there are more than 58,100 free ebooks lower in the listings. At time of this writing, I am number 84 which means my novella is presently more popular than the English Standard Version of the Holy Bible. I’m not sure how I feel about that. I think I have to just praise God for His perfect timing. Regardless, I thank you all, my dear readers, SO VERY MUCH, for reading my little labor of love. I would feel so very deeply DEEPLY honored if you would leave a quick and honest review on Amazon for any book of mine that you read. I am beginning a new adventure this year and hope to give all of my readers around the world some very special memories and honest reviews encourage and uplift me. If you haven’t read it yet, it’s free forever. Please download it and enjoy it. (Then leave me an honest review!) If you HAVE read it, please take a moment and leave an honest review of the book on Amazon (whether you downloaded it from there or not). I’m presently trying to get Greater Than Rubies listed on a marketing site in advance of releasing my next series, but the site requires a minimum of 18 reviews. It could open doors for me to get my books on library shelves and in other venues. Your reviews mean a lot to me personally and professionally and I DO NOT take them or you for granted. THANK YOU and I pray blessings for you every day. This entry was posted in 2. Greater than Rubies, 6. The Jewel Trilogy Anthology, Blog, Novels, Reviews. Bookmark the permalink.